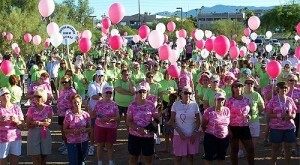 Lake Havasu Annual Breast Cancer Awareness Walk and Fun Run. Gather your family and friends for a fun-filled day to help raise awareness to breast cancer. The 17th Annual Breast Cancer Awareness Walk and Fun Run (BCAW), sponsored by the Cancer Association Of Lake Havasu was created to draw attention to the facts about breast cancer and show support to those brave women who have fought this disease. Lake Havasu residents will rally near the Aquatic Center this Saturday, October 17th at 7:30 a.m. At 8:00 a.m. the walk/run begins from the Aquatic Center to the English Village and back. You still have time to sign up your family and friends, form a team and gather pledges to help raise money for mammograms and other cancer-related services in Lake Havasu. The BCAW is a very significant source of funding for this low-cost mammography program. Registration fee is $30.00 when you register online or $40.00 the day of the event, to be a participant or sponsor. For more information you may also call 928-453-8190. If you’re unable to walk or run this year, please consider making a donation to support the low-cost mammogram program and other programs of the Cancer Association of Lake Havasu. Make your donation online or visit the Havasu Community Health Foundation (HCHF) office at 2126 McCulloch Blvd., #7. The Community Health Fair, sponsored by the HCHF will follow immediately after the walk/run. This special health event will run until 12 noon. There will be over 60 health related booths providing education, demonstrations, and information. Vaccinations for influenza, hearing, skin cancer, and other screenings will also be available. For more information, please call 928-855-5000.